Bernie Sanders’ historic upset in Tuesday night’s Michigan Primary, which the nation’s most influential polling aggregator estimated he would lose by 22 points, may prove to be the turning point in this election. That’s because Sanders’ two point victory in Michigan follows just a week or less after three other huge, but barely noticed poll-defying victories by Sanders in Colorado, Minnesota, and Kansas. Taken together with these other states, the Michigan upset is not, as America’s foremost poll analyst Nate Silver claimed, a freak event not witnessed since the New Hampshire primary of 1984, but part of a new pattern of poll-defying results that will, if they continue, carry Bernie Sanders into the White House. In the March 1st Super Tuesday contest, Sanders won Colorado by 19 points. The main pre-election poll there had shown him winning by only 6% of the vote, resulting in a poll-to-reality discrepancy of 13 points. In Minnesota, which Bernie won by 23 points, the only poll (with a “margin of error of 5.9%”) from the Minneapolis StarTribune prior to the election predicted that Clinton would beat Sanders by 34 points, adding up to a poll-to-reality discrepancy of 57%. In the under-reported Kansas contest on March 5, Bernie won by 35%, instead of losing by 10% as predicted, a poll-to-reality discrepancy of 45%. The compelling question that eight days of election results in Michigan, Kansas, Colorado and Minnesota raises is how accurate are all the other recent polls showing Clinton victories on the March 15th Super Tuesday sequel? If Bernie surpasses the polls in these states by as much as he just did in Michigan, he stands to score historic upsets in the important delegate-rich states of Ohio and even North Carolina. Why Aren’t Voters Listening to the Polls? The media drumbeat that Hillary Clinton has the election in the bag has been going on for months now. A few weeks ago, New York Times Washington correspondent Nate Cohn confirmed Hillary’s coronation in a column titled, “Hillary Clinton and Inevitability: This Time Is Different.” Cohn looked at the delegate count and compared Clinton’s performance in 2008 with how she was doing this year, and concluded, “If a candidate has ever been inevitable — for the nomination — it is Mrs. Clinton today.” Cohn was still at it the day after the Michigan upset, with a Times column headlined, “Bernie Sanders’s Win in Michigan Changes Race but Not Probabilities. Media experts like Cohn point to an abundance of polls masquerading as news as the basis upon which they inform voters that Hillary Clinton will be winning the primary election. Poll results translate into conventional wisdom and until the startling Sanders upsets during the past few weeks, become a sort of self-fulfilling prophesy. 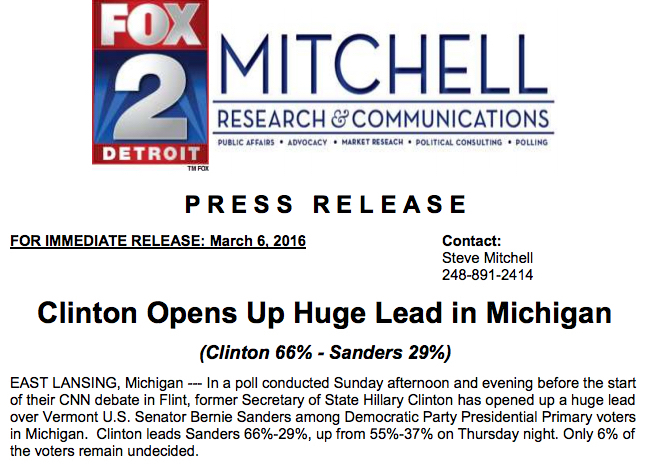 The March 6 press release by the Mitchell/FOX 2 Detroit Poll, viewable in its entirely here, is a great example of how this was supposed to work in Michigan. Michigan’s best pollster was off by 39 points. If Bernie exceeds the polls by this much on March 15 he will win every contest including Florida. But a funny thing happened in Michigan. Bernie voters didn’t listen to the polls, or the pundits. They turned out anyway, as they did in Kansas, Minnesota, and Colorado. And as the race heads into next week’s big Super Tuesday Sequel primaries, the purportedly scientific polls that today show a big Hillary sweep in every state suddenly seem a lot less scientific. 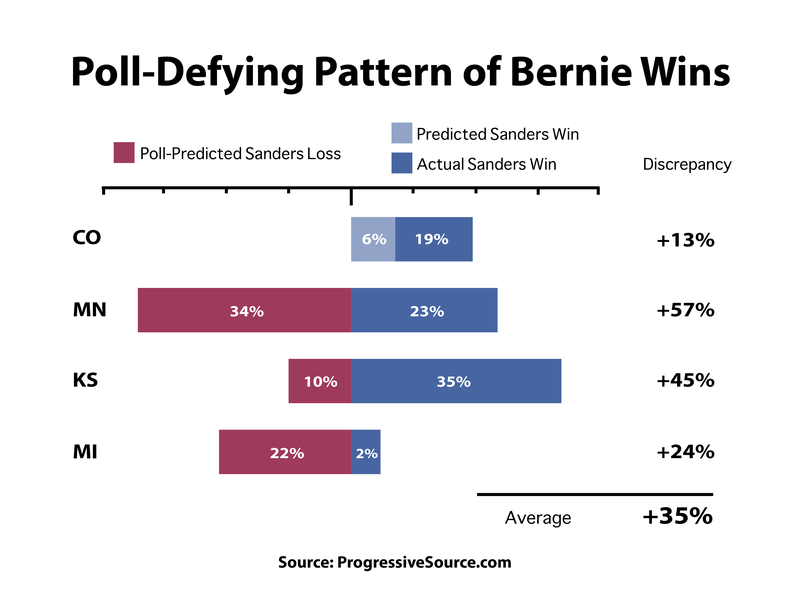 One more indicator that Bernie will be the Democratic nominee is the least known, even though it has the most successful predictive track record. American University’s Kogod School of Business tracked every Presidential primary since 1968 to determine which state primaries for each party were most likely to predict the eventual winner in the nomination contest. In their extensive study, only one state was found to predict the Democratic nominee 100% of the time for every presidential election during the last 50 years. Bernie won Kansas on March 5, with a poll-defying 67.7% of the vote.